Are you a lover of antique and vintage ironstone dishes like I am? For me, collecting ironstone dishes began with one very special piece…. ………a piece that I had completely forgotten that I even had. About five years ago, I started seeing vintage ironstone showing up in all the beautiful home decorating magazines. Displayed in old painted cabinets, on antique sideboards, and on open shelving in gorgeous kitchens, were these pretty dishes in different shades of white. The more I saw it, the more I became drawn to it. I loved it’s simplicity, and also the visual impact it made when displayed in large collections. Around the same time that ironstone started becoming very collectible, I was also in the process of slowly transitioning my own decorating style to one using more neutral colors. 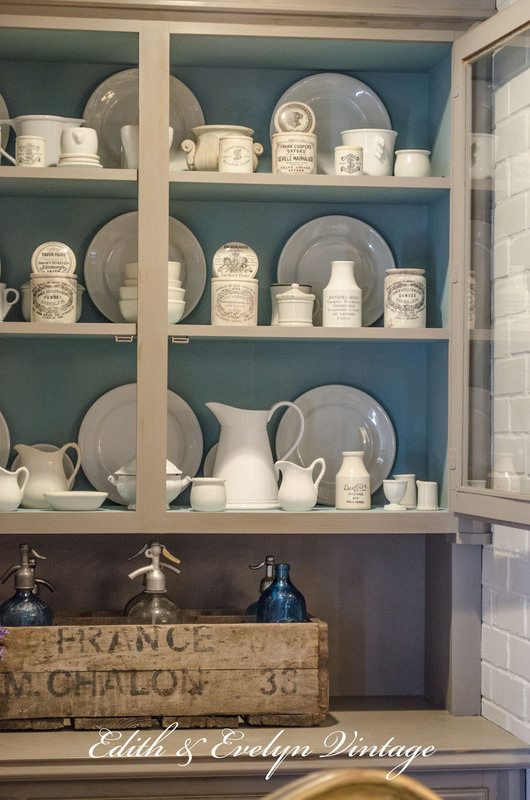 I was slowly changing out upholstery, painting walls, and generally decorating with more whites, creams, grays, and blues so I naturally became intrigued with the layers and texture that a collection of ironstone gave a space. I wanted those creamy pieces of ironstone stacked up in my own cabinet, so I made the decision to actively start looking for, and collecting, vintage ironstone. Then it suddenly dawned on me. I actually owned a piece of antique white ironstone. It was a lovely, petite, English sauce tureen by Bishop & Powell…..
……..a family heirloom that I had packed away and completely forgotten about. It had belonged to my grandmother, passed on to my mother, and then to me. My grandmother always called the tureen a gravy bowl, because that’s what was always served in it. The small sauce tureen was complete with an underplate that was always placed underneath it to catch any drips. I have many memories of meals served with this petite tureen used as a serving piece. The tureen was passed to my mother and she continued the tradition of using it for gravy. It usually her sausage gravy, made to smother the handmade, from scratch, biscuits that we all loved. This precious ironstone tureen has been well used by several generations, and I’m often amazed that it has survived without getting broken. Once I realized that I already had the first piece in my collection, I searched in earnest for more pieces to add, finding pitchers, tureens, platters, and bowls. It didn’t take long for me to amass quite a collection. In the beginning of my collection, I bought anything I could find at a good price, but as the collection grew, I started curating it a bit more. Now I only buy English or French ironstone, and have a special affection for ironstone with lion’s head handles, which is pretty rare to find. And butter pats….I have such a weakness for those little stacks of butter pats! I also love to find pieces that are hallmarked with the same marking as my grandmother’s tureen, Bishop & Powell. These pieces seem to be hard to find in our area, so I rarely find them, but I keep looking! During my search for old ironstone, I starting coming across English marmalade jars and French mustard pots, many from the late 1800’s. These old transferware advertising pots had such fabulous graphics and they displayed beautifully among my ironstone dishes. Lately, I’ve been on the hunt for more ironstone with advertising on it, and I’ve found some wonderful pieces! One of my most recent finds is the English pudding mold with the recipe printed on the outside, a rare French milk pitcher, and the huge French mustard pot. I also love collecting old English marmalade jars by Frank Cooper. Cooper is a family name, so perhaps old Frank is a distant relative? I like to think so! The Frank Cooper marmalade jars are a rarity and I’ve never found any here in the States, mine have all been bought from English sellers. The James Dundee marmalade jars are a bit more commonly found. The French mustard pots, with their wonderful French graphics, are a fabulous addition to the ironstone collection as well, with different styles, depending on the year they were made. My favorites are the very early ones from the mid to late 1800’s, with their skinny necks. It’s fun collecting antique ironstone, marmalade jars, and french mustard pots, and displaying them together. Prices have certainly gone up with the surge in it’s popularity, and, in my area at least, it is now getting more difficult to find. Vintage and antique ironstone can be found in so many different places……..flea markets, auctions, antique shops, thrift stores, estate and yard sales! It can also be found online at Ebay, Etsy, Rubylane, and 1st Dibs, just to name a few, and prices vary. Not sure how to recognize ironstone? Many times there will be a marking indicating that it’s ironstone. You can also tell by the weight of the piece, it is weighty like earthenware would be. Also, it will always be opaque. Under light, you shouldn’t see any translucence. Some common English makers of ironstone are Wedgwood, J&G Meakin, Wood & Sons, Birks Bros. & Seddon, T & R Boote, Turner & Tomkinson, Bishop & Powell, and Johnson Brothers. These makers are usually hallmarked on the underneath side of the piece. Some American makers are Red Cliff, Knowels, Taylor & Knowels, and W.A. Lewis. If you’re not sure, flick the piece with your finger….ironstone should have a ringing sound. I recently found a couple of small German condiment pots, and though they are made of porcelain, I think they look great displayed among the ironstone. Ironstone varies in prices so decide on a price point that you are comfortable spending. And if you’re on a budget, begin by collecting smaller pieces like creamers, small platters and bowls. 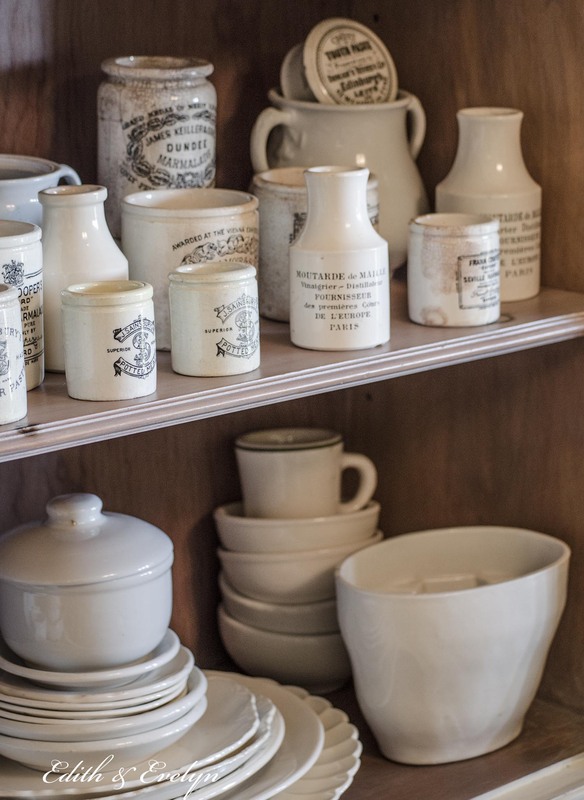 Collect what speaks to you….some people collect certain pieces like tureens or sugar jars, others may only collect English ironstone, or ironstone by a certain maker. In the beginning of my collection, I bought anything I could find at a good price, but as the collection grew, I started curating it a bit more. Now I concentrate on English or French ironstone, especially those pieces with lion’s head handles or old advertising. Start small with one or two pieces, and slowly add to your collection. After all, the thrill of the hunt is part of the joy of collecting! Hope all is well with you. This month marks two years already that my sister went home to our Lord. I know we shared with each other about losing our dear sisters to soon ! I too love the little butter pat dishes, I have a few of those too. I was wondering about the silverware I see the handles sticking out , love those but can never find them ! Oh, sweet Paula, it’s still hard, isn’t it? This time last year, we were just discovering my sister’s terminal diagnosis. We only had a couple of months left with her. Many days, I only have wonderful memories, and other days, I’m assaulted with missing her. I know you feel the same. Virtual hugs, dear friend. The silverware is vintage bakelite. I don’t really use it, I just use it for display! I usually pick it up at flea markets or estate sales. Prices can vary and be all over the map, but I usually don’t pay a whole lot for it. I love your ironstone Cindy! Collections really make a personal statement in a home, and it also makes antique hunting so much more fun!! Oh, Pam, you are so sweet with your kind words! Thank you so much! I’m not sure any of my children will be interested in inheriting a lot of my things, though I have one son that loves the old religious artifacts as much as I do, so I’m sure he will love them. But interests change as we age, so who knows, they may become a lover of all my antiques down the road! Honestly, I don’t know very much about seltzer bottles. I tend to collect them if I like the color (usually blue) and if the are French in origin. Those are a little hard to find, I guess that’s why I don’t have very many of them! Thanks so much for following along and commenting! I really liked these pieces. Your collection is beautiful. Thanks for sharing. Cindy, Your collection is just lovely! Isn’t it wonderful how collecting something we love just makes us happy every time we see it? Hope the week ahead is full of joy! You have a wonderful collection. I have a small collection of the mustard and marmalade jars. My mustard collection I found on Etsy from France. I adore transferware a d started collecting pieces I love. How wonderful, Cindy! Thanks so much for commenting! My luv for ironstone, and dishware on a whole started as a small child visiting my grandmother. My maternal grandmother was French nd her house to me was luvly! Homey nd perfect. The everyday dishes, bue willow ironstone. Sigh. We lived on the Same property, 2 separate houses and I spent most of my time with her. Her stories and songs… As an adult, I found myself recreating my grans home. And over the years have amassed quite a bit of Jonhson Bros. Meakin. Wedgwood. Knowles. Independence ironstone… It makes my heart sing to use them daily. Luv your big white collection. What a wonderful memory, Gee! It makes your ironstone collection so much sweeter, doesn’t it? Thanks for sharing! I am not much of a collector because I am trying keep my home simple and uncluttered. However ironstone is something I’m definitely attracted too. I love the clean simplicity of white and have a lot of white in my home. You have a beautiful collection. Thank you for the tips on collecting ironstone. Love all your ironstone. It looks great with so many grouped together. I’ve been collecting a French line called Austier de Villatte. They are new pieces so I don’t get the thrill of the hunt, but it’s very special when I get a new piece to display. The only problem is that they are very expensive so my husband or son usually gives as a gift. Look them up I think you will like! Thanks for the tip, Linda! I’m going to check them out! Thanks, Maureen! I will check it out! Hello Cindy….. just love following! So much inspiration….. how do you know it’s ironstone? Will there always be a marking? Many times there will be a marking indicating that it’s ironstone. You can also tell by the weight of the piece, it is weighty like earthenware would be. Also, it will always be opaque. Under light, you shouldn’t see any translucence. Some common English makers of ironstone are Wedgwood, J&G Meakin, Wood & Sons, Birks Bros. & Seddon, T & R Boote, Turner & Tomkinson, Bishop & Powell, and Johnson Brothers. These makers are usually hallmarked on the underneath side of the piece. Some American makers are Red Cliff, Knowels, Taylor & Knowels, and W.A. Lewis. If you’re not sure, flick the piece with your finger….ironstone should have a ringing sound. Thanks so much….. I’m going to start going to estate sales and I will make great use of all your info! That’s wonderful, Ruth! Thank you so much for commenting! I love your collection! I too am a lover of old ironstone. I had been collecting for many years before I even realized they were collectible! They make such a beautiful statement in any room and you cannot go wrong with a white piece of ironstone and pretty flowers. I love your advertising pieces. I haven’t found anything here in Michigan like that, but it won’t prevent me from hunting them down. Thank you for a great post! Thank you so much for commenting, Lia! You have a most beautiful collection that I have admired from afar!!! I must say that one of my fav pieces has to be the one of your grandmother’s as it is a most treasured family piece of wonderful memories. Thank you for sharing your gorgeous collection with us today!! Have a great week Cindy! Thank you, Shirley! My grandmother’s tureen holds a special place in my heart, so much so, that I refuse to use it. I’m worried that it will get broken! Have a great week, friend! I was gifted a set of ironstone dishes from my grandmother. I fell in love with ironstone before it was “cool”. It is one of my favorite things! You have a lovely collection! Oh, yes, purple transferware…..I have such a weakness for it, and in our area, it’s very difficult to find. It’s a new collection for me and it’s growing rather slowly, but it’s fun to hunt for it! My sister has a wonderful collection of Ironstone. Cindy, a wonderful post with great information. My goodness, your collection is beautiful. I have a few ironstone pitchers, mainly to hold my peonies in the spring. My love has been teacups and saucers, old butter molds and blue crockery mixing bowls. I have to look the other way with the ironstone. I am out of room ! Oh, I know, Sandra! There are so many things I would like to collect, but so far I’ve managed to refrain myself! I’m really enjoying your blog! So glad you started after admiring your work and shop. You’re quite the inspiration ! It is the one thing I search for before anything else at every brocante I visit, but it is becoming harder and harder to find. However, it’s timeless elegance and down to earth practicality means it will never go out of style. Your collection is absolutely fabulous. Thank you so much, Susan! I love searching for the rarer pieces now, and you are so right, it is timeless. Thanks for commenting!